Young children have so much imagination and creativity inside them. That’s until the school system and many grown-ups manage to suppress both as the kids grow up. So I try very hard not to do that at home. I let my kids access most of the art & craft supplies on their own, and my dining room table features a container of colored pencils as a permanent decoration. 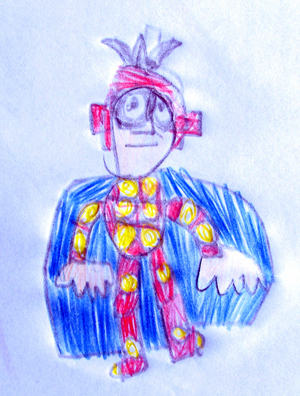 My kids draw every day and I often draw with them, especially since it’s the only time of the day I have time to practice my drawing skills. My four-year old is now starting to draw recognizable shapes. Most of them happen to be vampire robots covered with blood, so I’ll spare you the gory drawings. 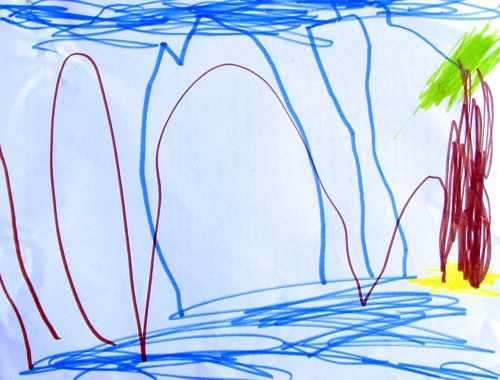 We’ve been watching Alvin & The Chimpmunks – Chippedwrecked a little too much recently (it’s actually a pretty funny movie), so my son decided to draw his own island, palm tree included, surrounded by the ocean and some big waves, and mountains in the background. I can see all that and you probably will too, after looking at it for a little while. 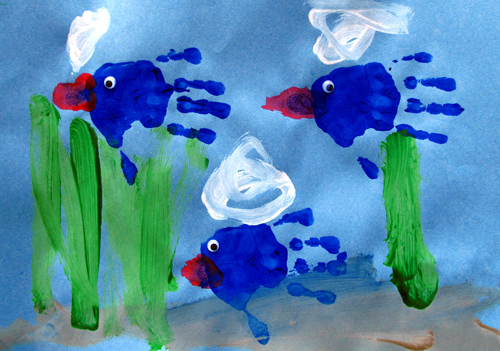 Continuing with the ocean theme, he painted this underwater scene at school last week. His teacher is very creative and I’m jealous she gets to do stuff like this every day. Believe it or not, there’s more to go with this ocean theme. 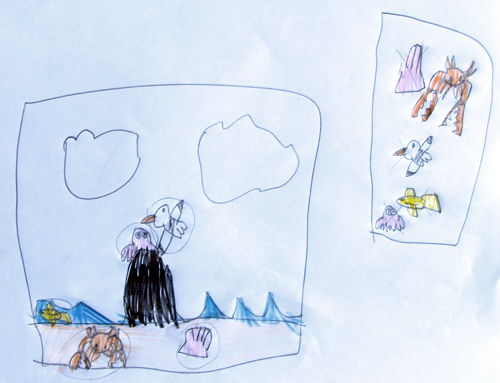 A couple of months ago, my five-year old decided to create a game consisting of “finding the hidden… in the picture”. Even though the creatures are not hiding very well, I still give him kudos for his creativity and his artistic talent. As for me, I managed to find more time to take pictures than to draw and it happens to be my only creative opportunity for now. Sometimes the photos come out great, and sometimes they don’t. 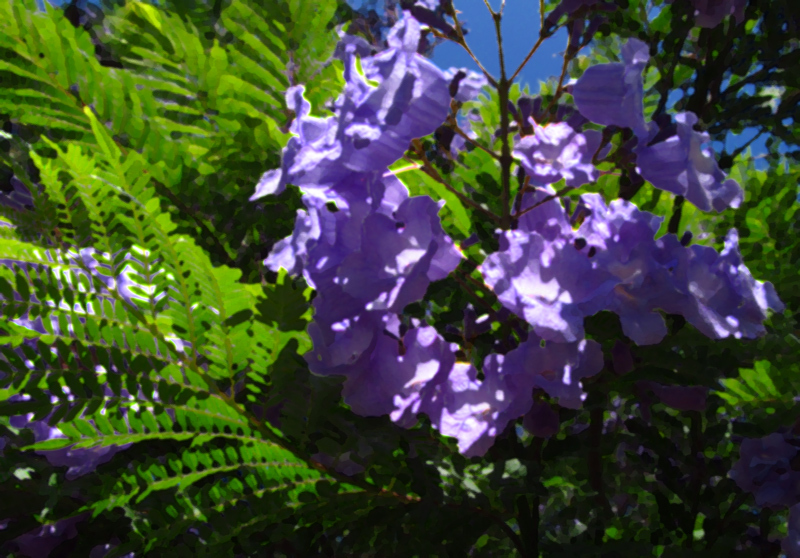 I tried my best for the photo below but the light was just in the wrong place, at the wrong angle, and only a few pictures of the jacaranda turned out OK. We’re lucky to have many jacaranda treesin the San Diego area, which display their beautiful purple blooms in May and June. After taking many close-up photos of the blooms, I’ve come to the conclusion the tree looks much more beautiful when pictured as a whole. 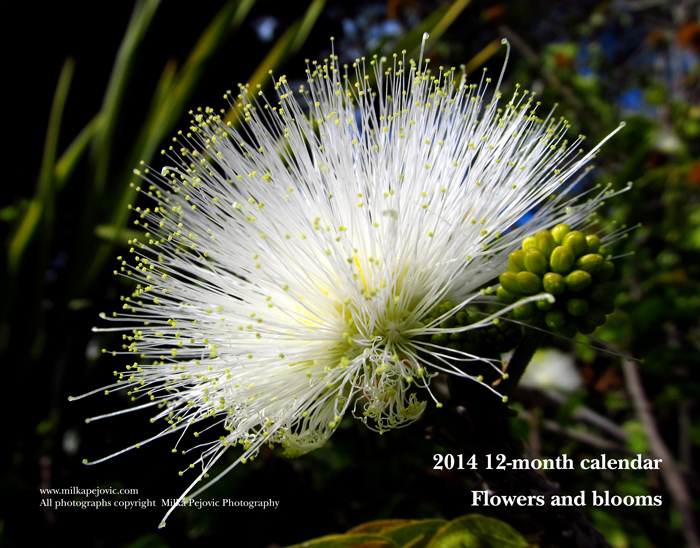 I’m running out of time to take more pictures this year so I’ll have to fine some good looking trees next year. But a not-so-good photo can still turn into a pretty sight if you use creativity and the magic of Photoshop. Here’s my average jacaranda photo as a bright and colorful painting. What do you think? Isn’t close always better than far, distant? 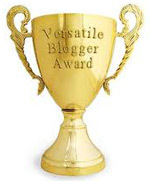 We enjoy close relationships and being close to the finish line. OK, sometimes things can get too close for comfort. For me, that would be spiders. When it comes to photographs, unless I’m aiming for a panoramic shot, I always think closer is better, even if it means cropping my picture when I open it on the computer. The best photos I have of my kids as babies are close-ups, featuring their beautiful blue eyes and rosy fresh skin. It’s more of a challenge today since my kids rarely sit still long enough for this type of shot, and their smiles often look more forced than candid. But I’m not giving up on these shots; I’ll probably manage to get a few when they’re a little older. My best subject for close-ups today? Nature, especially on windless days. 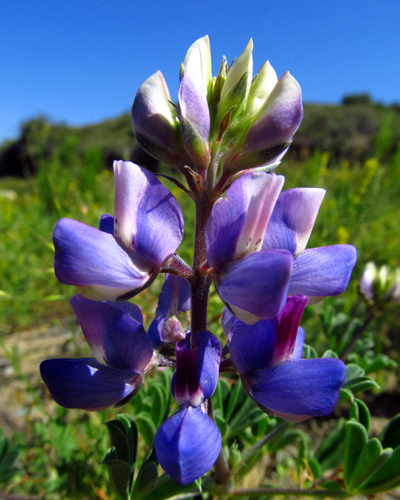 Here’s a picture of lupine I took a few months ago at a regional park not far from my house. I entered the park’s photo contest with it and I don’t think I won anything, but I’m still happy with the way the photo turned out. 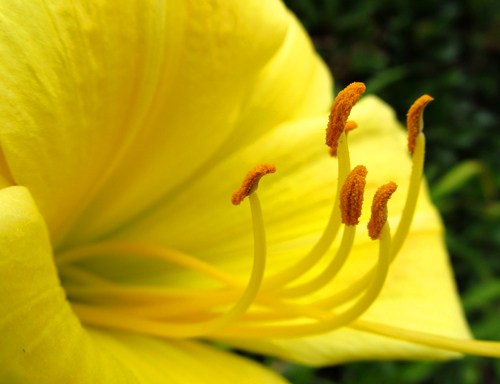 I love taking close ups of flowers and their pollen. Sometimes you can even find a bee in there. There was a bee buzzing around on the day I took this picture but it was camera shy so it refused to make it into the shot. 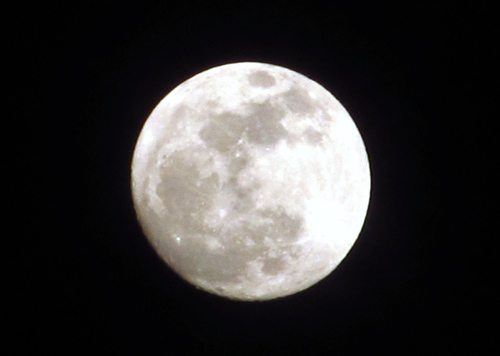 As for the last picture, I took it the night of the “supermoon” in early April 2012. Clear skies and a large moon make for a great close-up.